Not everyone’s lucky (or unlucky!) enough to own their own fishing boat or kayak. However, renting is an option at several ports in Natural North Florida. Whether you fish, scallop or just want to go for a boat ride, renting may be right for you. It’s always nice to return to the dock and simply hand over the keys (or the paddle) to the marina or outfitter. No cleaning or trailering–just lots of fun. Expect to pay an hourly or daily fee, plus fuel (if applicable) and to leave a credit card and identification as a deposit. Different marinas and outfitters have different contracts and rules, and it’s very important that you listen to any instructions you might be given. Even if you’re an experienced boater, remember that rental craft may be different from others you’ve used. Also, remember that the folks who rent boats are happy to give you advice about hazards and fishing spots. Just LISTEN! 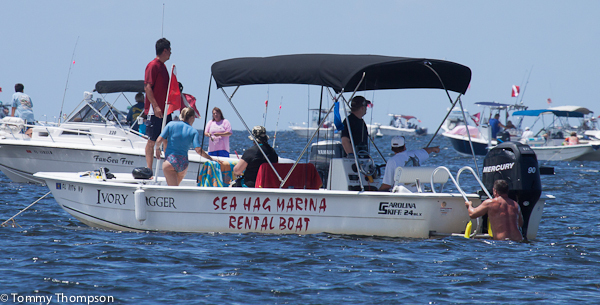 A typical rental boat, outfitted for scallop season. It’s also important, especially during winter trout and summer scallop season, that you call ahead for reservations. 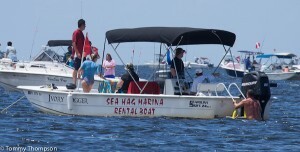 Here’s a list of boat rental places along the Big Bend and Natural North Florida.